If you are a new teacher, perhaps one of the most daunting tasks can be mastering classroom management. It takes time. Every Professional Development session that you attend on this issue includes some combination of strategies to increase and maintain student engagement, and pointers for creating a consistent classroom management plan that addresses students who have difficulty adhearing to classroom expectations. 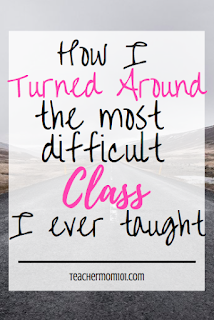 Because an engaged clasroom is a well-managed classroom. But what do you do if it's not? Even the most seasoned teacher can be blessed with that one class that just cannot seem to stay engaged and follow classroom expectations. They challenge your management plan, scoff at your PBS plan, and make you dread that class period every single day. You fear an impromptu observation from administration during that class period. I hear ya, I've taught that class. And then, I've taught the class from hell who surpasses all of that. My classes are clustered, meaning that my students travel together all day to each of their classes. A lot of times this means that whatever drama, issues, or arguments that they had in a previous class get drug into my classroom. 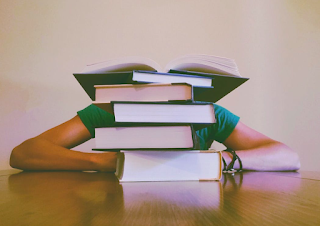 Most of the time, keeping them carefully grouped and engaged in student-centered activities aleviates some of those issues, but sometimes the combination of students in a cluster is chaoitic no matter what you do. 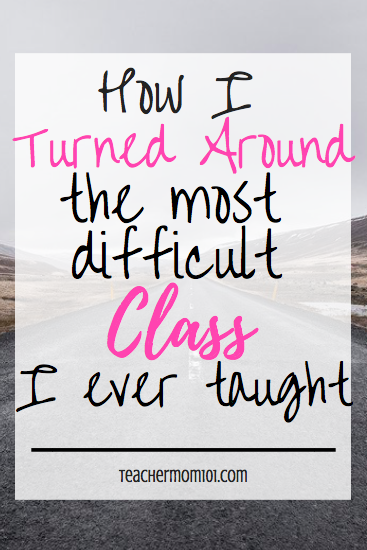 This year, I had, hands-down, the most difficult class I have had yet. 19 students in an intermediate-level ESOL cluster, mostly boys, who love nothing more than getting under one another's skin. I had trouble managing them in even the most basic of ways - come in the classroom and sit down. Nope. They wouldn't do it. Bell work? Forget it. They came in screaming every. single. day. Touching each other. Hitting each other. Throwing things. Every. Day. I have a "don't yell" policy, but, I yelled. A lot. Because I didn't know what else to do. And then one day mid-lesson, I raised my hand to quiet the class for probably the 25th time in 10 minutes, and I stopped class. I told students that we were done for the day and that they were going to spend the rest of the period writing a letter to their parents detailing their behavior in my class. I told them that not only was I going to give them a grade for this assignment, but that I was going to send them home to every one of their parents. They wrote for 15 minutes in silence. The students were aware of their behavior. They wrote that they were disruptive, disrespectful, that they were not following rules and procedures, that they were rude to their teacher, and that they were not doing their best. They apologized. They told their parents in their letters that they were sorry and they knew that they were letting them down. They knew that they weren't doing their best and they would try to do better. The next day I discussed the letters with students, and I told them that they clearly were not raised by wolves, and they had good parents who taught them right from wrong and had high expectations for them. I reminded them that I had high expectations for them as well. Then I told them that their parents would always forgive them for making mistakes and that I would, too. After that experience, I had significantly less issues with those students. I do not dread that class anymore. We still have some difficult days, but it is much easier to wrangle them now than it was. Sometimes the best prescription is a little self-reflection. Putting my students in a position where they had to spend time reflecting on their behavior and take ownership of it made a world of difference. I have been able to return to my no-yell policy and be the teacher that my students deserve. If you are facing an unruly class and feeling frustrated, do not give up. Classroom management can be a tricky thing, even for a well-seasoned teacher. Not every classroom management problem is directly your fault, so don't internalize the problems and view them as a reflection of your incompetence. Think outside of the box. Kagan and Marzano and the dozens of other bottled-packaged-and-sold student engagement programs can be wonderful, but YOU are the one standing before your students every day - figure out what makes them tick and capitalize on it. It might be the most unconventional thing that none of the books touch on. Do not be afraid to go off the beaten path! Most importantly, hang in there. You are doing good work, you are important, and you are appreciated. What age group was this? What if the parents are not around? You said they were ESOL, did you have a translator available to you for the letters? Parental threats get laughed at in my school. I have similar situations but some of my students are not even ESOL just disadvantaged kids from unpleasant homes. This is 7th grade, but some students are as old as 14. I do have tutors in my room with me who speak the native languages of my students, Spanish and Haitian Creole. We don't have a lot of parental involvement at my school either, closer to "none" than "some," really. It makes it difficult to reinforce when you don't have parents who back you up! I think the reason that this was different is because instead of me calling home and telling parents about their behavior, they were the ones who had to be honest and fess up. I don't think it was even the letters themselves or the threat of having their parents read them, but rather the process of self-reflection that made the difference. Once they saw their behavior admissions written on paper, it was apparent to them that we had a problem. The accountability made the difference! Some of my most difficult art classes....including my current “Nightmare” class....has 30 students. Of that number, 15 have IEPs (Including emotional support students)....4 others are autistic...2 others are ESOL. The class is made up of 19 boys vs 11 girls. It is an 8th grade class, but the administration placed two 7th grade boys in the mix. Of the students without IEPs, quite a few are our extremely heavy-hitter behavior issue students. One boy walks in over 5 minutes late every day as I am trying to instruct. .....Trying. The aide for the autistic students comes at the beginning of the 50 minute class and then leaves after 20 minutes to take her break for the rest of the period. There are no other teachers or aides in the room. I just started with them...they will only see me for this final 4th marking period. I have them for 45 days total...I have only had them for 7 days so far. Because they are 8th grade, they will not only leave my class, but also graduate from our middle school in 38 days. I can hardly get a sentence out without interruption. They throw things. They taunt each other. I spend 99% of the period on discipline. I can’t even help the students that are trying to do the work. There is no way a letter home will be willingly written by any of them except for the very few who don’t really need to. And for a couple others who might give in and do it, their parents would contact me or the office and accuse me of not Doing my job by making them doing writing. Most of them would sit and talk and taunt each other instead of writing. I wish writing a letter would help this situation. What is needed is a supportive administration who isn’t afraid to stand up to the parents. And what is needed is the ability to fail students for not doing their work....to hold them accountable for their decisions....to make it possible to hold them back a year if they have not learned and passed their classes. Wow does this resonate with me! We might teach at the same school! Actually, unfortunately I think that your experience isn't only similar to my own, but to most teachers in America right now. The lack of respect for educators in general is a really big problem! I once sat in front of an unruly class for an entire class period in silence, hoping that they'd get the message after weeks of trying everything else. They never stopped talking. Teaching is such a difficult job and I completely feel your frustration! If administration isn't backing you up, that's a problem. Your frustration is completely justified. There is no doubt that the system is extremely broken, and I'm not sure what the answer is to fix it. I am sooo sorry that you are having such a rough year. Just know that there are millions of us just like you who are doing our best every day and feeling the same frustrations. ((hugs)) Hang in there, summer break isn't too far off! I just don’t know much longer I can hold on for things to change. This is my 25th year. The last 10 have demonstrated an ever increasing shift in extremely difficult student behavior without increased support. We had a faculty meeting last week where we tried to express our desire for help from our vice principal. One of his responses was, “No one said that teaching would be easy.”. Hi Art teacher! This has been my 28th year in teaching. Last year, I had a similar challenge to my teaching. I could not get a large group of boys to stop interrupting my lessons. I was so frustrated with how I wasn't able to teach, but my job evaluation had a percentage of my students' test scores that are improving. There wasn't parent support that was making a difference with student choices in class. I had 4th grade last year. I figured out something to do that made a difference. I was lucky enough to have 1 to 1 devices, so I started making videos for my lessons. Every child could "plug in" to my teaching, and it freed me up to walk around and monitor behavior. For the students who were paying attention and giving effort no longer had their learning being taken over by poor choices from others. It took the "audience" away from the boys who were causing the trouble, and it got better. After 2 weeks, I was able to teach the whole class again without the big disruption. What I like about making videos is that I am doubling my teaching power with students. I can assign videos while teaching small groups. For you as an art teacher, making a video of your directions that you can show to the whole class would free you up to use proximity control with a few children. Also, you don't have to repeat your directions, you can assign the students who didn't get it to listen to the video again. I think this is a great tactic to have on hand. Did you end up sending the letters? That was my question... did she send those letters to parents? I did not end up sending the letters to parents. I really didn't need to. I discussed the letters with my students the next day and they were shocked that their classmates had also been honest about their behavior and that they had all acknowledged that they were out-of-line. Like I said, the reflection part of the activity was more powerful than telling parents. I do call parents often, and with this particular group, it wasn't making a difference. Any ideas for working with 1st/2nd grade students? I'm not sure whether that age group of students possess the maturity to be that honest and/or self-reflective. We have some students who are really testing us this year. Maybe give proactive circles a go? I wrote a post about that - they are effective for any age group! I find it amazing that teachers all over the country who teach in every demographic and age group are having the same complaints about student behavior. I worry about what this means for the future of our profession. It seems that every year the kids get more and more difficult to engage! When I taught 1st and 2nd grades, stickers were my friends. I would take them out, hand out a sticker, and loudly compliment the students who were following my directions/expectations. Within minutes, the other students would also fall into line because they wanted the positive strokes as well. Even if the student wasn't doing the correct behavior before I was giving out stickers would still receive one if they started doing the right thing at that MOMENT. The more that you focus on what is being done well, and completely ignoring the incorrect choices is important, as well as consistency. Individual conferences with students (like during recess, or keep for a few minutes out of gym, going home, etc.) in private would work too. I would start with a phrase that I learned from a Profess. Devel. session was, "Is there anything that I should know that is preventing/stopping you from learning in our classroom?" Also, I have another "rule" that is the overarching rule for everything: You may not do anything that interferes with someone else's learning. Things like: "keep hands and feet to yourself" and "raise your hand before speaking" are just examples of what the big rule looks like. Go back to procedures when they are not doing what they should, at any point in the year. I couldn’t agree more that the fact that so many of us are having similar experiences is very concerning. I have a grade 6 class of 31 students this year. 20 boys and 11 girls - 10 who have IEPs (and another couple who should). FAR too many academic, social, emotional, behavioural needs for ONE person (me) to meet yet here I am. The behaviour is out of control and I feel like I have tried everything. We have very little parent interest or support as well. It got so bad that I ended up going on sick leave from the stress. I’m now doing mornings only which is better but student behaviour has not changed. All my time goes to managing behaviour and the ones who are actually trying to learn can’t get the help they need from me. I’m trying to shift that focus, but it’s hard. I really feel very strongly about smaller class sizes and far more support from parents and administration. Also, kids need to be accountable by being able to fail. They have no real consequences for their choices how can we expect them to change? I am glad for you. Yesterday I was slapped by a student and neither the girl nor the homeroom teacher saw the problem with that... What you did is beautiful, but sadly there are already people who are way beyond self awareness. What did you do if there were students who refused to write the letter? What did you do after you spoke to them?